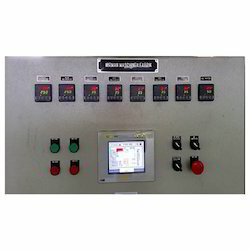 Manufacturer of a wide range of products which include plc panel with hmi. To keep the client satisfied, we manufactur and supply high quality PLC Panel with HMI. Our offered panels are widely used in both, commercial and non-commercial areas. Owing to their hassle-free performance and low maintenance cost, these panels are widely appreciated in the market. Our panel is manufactured to match up the needs and choice of the clients. We offer products after testing them under the supervision of our team of engineers. Looking for PLC Panel with HMI ?